Famous Portrait Painters of Ireland: William Orpen, Martin Shee, John Butler Yeats. 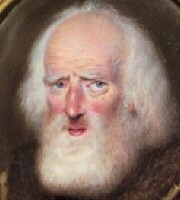 Irish artist Nathaniel Hone the Elder. Of all the genres, portraiture is arguably the most affected by the ethos and prosperity of the times, not least because of its technical demands on the artist. Portraitists tend to come from those with a background in academic art, which is no trivial barrier. Finding customers is another issue. For centuries, the only regular source of patronage for visual arts in Ireland, were Anglo-Irish merchants or country landowners, along with those from the upper ranks of the ruling administration, in Dublin, Cork or other provincial centres. As a result, many would-be portrait painters left Ireland in the 18th and 19th centuries to pursue their careers in London, where artist studios and potential patrons were significantly more plentiful. Some returned, most did not: at least not until the era of post-war independence. Initially thereafter, the demands of statehood provided a valuable boost for portraiture, in the form of commissions to portray a range of Irish heroes, both living and deceased, as well as an increased number of works for the clergy. Unfortunately, the Second World War and the resulting economic depression swiftly put an end to this and triggered a new wave of artistic emigration. Since then, advances in photography and video have largely displaced the fine art of portraiture as a means of personal commemoration. Portrait art began in Ireland during the late seventeenth and early eighteenth centuries, some fifty years or so before the advent of topographical 'land portraits' or landscapes. Its earliest exponents passed largely unrecorded, except for Garret Morphy (fl.1680-1716), who dominated the genre at the end of the 17th century, and the lesser known Thomas Bate (fl.1690-1700). 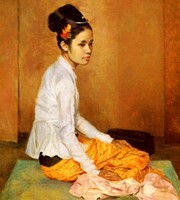 Portrait of Mah Aung Saw Myang. The Dublin-born but London-based Charles Jervas (1675-1739) was the top Irish portraitist of the early eighteenth century, trailed somewhat by the more flamboyant Dublin-based Hugh Howard (1675-1737). Then came the first major Irish portrait master, the Tipperary-born James Latham (1696-1747), whose paintings had a significant impact on his contemporaries and followers. The latter included the semi-Rococo artist Stephen Slaughter (1697-1765), the painter and printmaker Thomas Frye (1710-62), as well as the less important Philip Hussey (1715-83) and Anthony Lee (fl.1724-67). The Cork history painter James Barry (1741-1806) who established himself in London during the 1770s and 1780s and (for a time) became Professor of Painting at the London Royal Academy, was another skilled portraitist of the period, as was another Corkman - Nathaniel Grogan (c.1740-1807). Among notable portrait artists working in Dublin, were Nathaniel Hone the Elder (1718-84), Hugh Douglas Hamilton (1739-1808) who specialized in pastels and chalks, Thomas Hickey (1741-1824) whose preferred media also included crayon, Francis Robert West (1749-1809) and the master miniature-painter Horace Hone (1756-1825). Other interesting artists included Matthew William Peters (1741-1814), the Corkman Robert Fagan (1767-1816) who painted many of his classical portraits in Italy, and the Dublin artist Robert Home (1767-1834). Ulster, meanwhile, produced three talented portraitists: Robert Hunter (fl.1752-1800), Joseph Wilson (fl.1770-1800) and Thomas Robinson (d.1810). Hunter was largely based in Dublin, Robinson in Belfast, while Wilson worked in both cities. Although a number of Irish artists - like, Edward Hayes (1797-1864) and the miniaturist John Comerford (1770-1832) - were busy with portraiture in Ireland in the early nineteenth century, the most famous artist of the genre was the London-based Sir Martin Archer Shee (1769-1850), a Dubliner whose family came from Kilkenny and Mayo. Shee later became President of the Royal Academy. Two other notable Irish artists working abroad during this period include the miniaturists Adam Buck (1759-1833) and Samuel Lover (1797-1868). These were followed by two exceptional talents: the versatile genre-painter, landscapist and portraitist William Mulready (1786-1863) from County Clare, and the great Daniel Maclise (1806-70). Unlike the lesser-known Irish artist Richard Rothwell (1800-68), who went (unsuccessfully) from portraits to history painting, Maclise made the move with no apparent difficulty, securing his reputation as a large-scale history painter on the back of his early skills in portraiture. A major contributor to Victorian art in Britain, his murals in the Palace of Westminster set the standard for narrative painting for years to come. The second half of the 19th century and the first 20 or so years of the 20th century, was arguably the golden age in the history of Irish art as far as portraits were concerned. The era began with the works of Stephen Catterson Smith (1806-72), later President of the Royal Hibernian Academy, who was active in Derry and Dublin. It continued with contributions from Henry Jones Thaddeus (1859-1929) - mostly society portraits - and the Impressionist Walter Frederick Osborne (1859-1903) - see his portrait of Nathaniel Hone the Younger; from Roderic O'Conor (1861-1940) - see his Self-Portrait; and from Frederick William Burton (1816-1900). 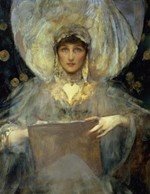 Another important Irish portrait painter of the time was Sir James Jebusa Shannon (1862-1923). During the mid 1880s, Shannon, along with American John Singer Sargent, dominated British portraiture. Meanwhile, the County Down-born John Butler Yeats (1839-1922) was producing forceful portraits of several important figures in the arts of Ireland, not least those of his sons WB Yeats and Jack B Yeats. Also active were the women portraitists Sarah Purser (1848-1943), Sarah Cecilia Harrison (1863-1941) and Kathleen Bridle (1897-1989), as well as the academic artist Gerald Festus Kelly (1879-1972). But towering over his contemporaries with his draughtsmanship and style, at least during the first decade and a half of the 20th century, was the great Sir William Orpen (1878-1931), whose professionalism and polish influenced Irish artists for decades to come, including: Margaret Clarke (1888-1961), Sean Keating (1889-1977), James Sinton Sleator (1889-1950), Leo Whelan (1892-1956), and Maurice Macgonigal (1900-1979). For Orpen's position in the pantheon of famous artists from Ireland, see Most Expensive Irish Paintings. After Orpen's dominance, Irish portraiture was left in the hands of the traditionalist Sean O'Sullivan (1906-64), the figure painters Lilian Lucy Davidson (1893-1954), Charles Lamb (1893-1964) and Patrick Tuohy (1894-1930). Technically, Louis le Brocquy (1916-2012) eschewed portraiture, but his later semi-abstract heads of James Joyce, Samuel Beckett, Pablo Picasso et al, are compelling examples of his unique style. Among the next generation of Irish portrait painters, many of whom were (and are) also active in other genres - are Basil Blackshaw (b.1932); the great Edward McGuire (1932-1986) who studied under Lucian Freud; and Brian Bourke (b.1936), to name but a tiny few. In recent times, the classical style of portrait painting has been revived by Irish artists like Ken Hamilton (b.1956). See also: Oil Painters of Ireland. 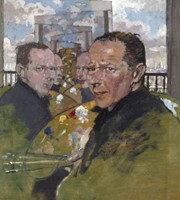 The National Self-Portrait Collection of Ireland at the University of Limerick, features over 400 self-portraits by Irish painters and sculptors in a wide variety of media. For more information, phone: 061-333-644.  For more details of Portraiture in Ireland, see: Homepage.